Look who's in town. The UK leg of The Minimalists Tour opened on Friday 8th October in London and finishes on October 31st in Dublin. 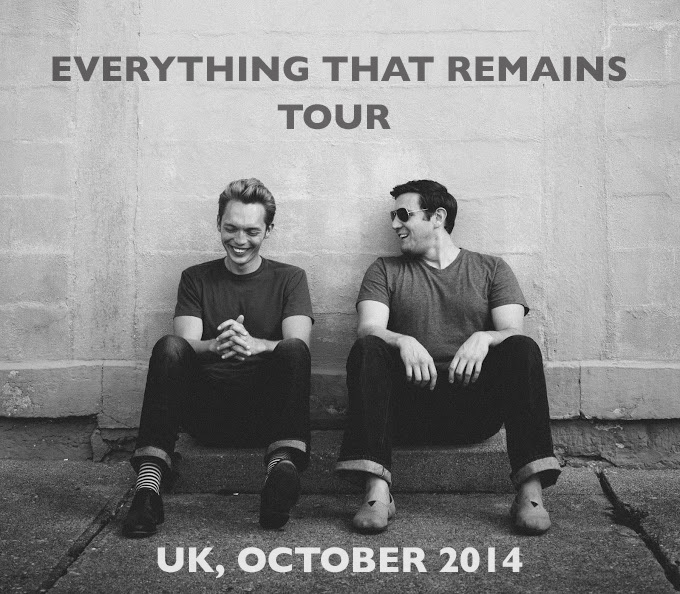 This Friday evening I shall be hotfooting it over to Birmingham to see Ryan and Joshua from The Minimalists, give a talk about their minimalist journey and read excerpts from their new book, Everything That Remains. What I love about these two is their capacity to demonstrate how minimalism can impact positively on any aspect of your life whether it's decluttering your home, streamlining your schedule or cutting junk out of your diet. Discovering minimalism as a philosophy has been life changing for me and little by little it's beginning to change different areas of my life. Quite simply, life has been more meaningful for me since my first encounter with minimalism four years ago. This month, thanks to Ryan and Joshua, minimalism is about to get momentous in the UK and I think it's going to be exciting. If anyone has already seen The Minimalists on tour, or has plans to, I'd love to hear from you. I'm also excited to tell you that Tim and I are going to see them in Sydney on November 10. What a wonderful contribution to minimalism they are making with this world tour! Where in birmingham is it? Hi Kynn, here' are the details . It's ot in the centre but in Kings Heath - entry is free. I am going to see them in less than a month! November 12 in Melbourne, I am so excited, really looking forward to it. I am taking my 18 year old daughter who I am hoping will not just enjoy it but maybe be a little influenced?! I can't nag though as my minimalism journey is a slow one, slow but steady! Lovely to hear from you Jenni. Would be wonderful if your daughter can use minimalism in her life too. Good luck with your simplifying! I saw them in Phoenix, AZ and then again in Does Moines, IA. I liked listening to their talk but I loved the conversations with those around me prior to and after the event. The audience was eclectic and at different stages in their pursuit of minimalism. Some had put it on their calendar the moment the tour was announced, others came across it in the event section of the newspaper that morning. Have a great time! The thought of the audience does intrigue me - thanks for sharing your experience, I shall make sure I connect! I'm going to see them in Belfast next week. First minimalism/simplicity event I've heard of in Northern Ireland. Been following their blog for quite a while now.